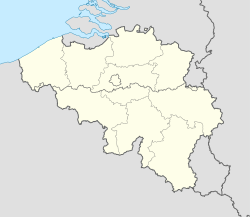 This article is about the municipality in Belgium. For other uses, see SPA. Spa (Walloon: Spå) is a Belgian town located in the Province of Liège, and the town where the term spa originates. The town of Spa is situated in a valley in the Ardennes mountains 35 kilometres (22 miles) southeast of Liège and 45 kilometres (28 miles) southwest of Aachen. In 2006, Spa had a population of 10,543 and an area of 39.85 square kilometres (15.39 square miles), giving a population density of 265 inhabitants per km² (685/sq mi). Spa is one of Belgium's main tourist cities. The town of Spa is famous for its several natural mineral springs, and is also the location of mineral water producer Spa, whose mineral water is exported worldwide. The renowned Circuit de Spa-Francorchamps, which hosts the annual Belgian Grand Prix, is in the village of Francorchamps near Spa. The first beauty pageant in the world was the Concours de Beauté, held in Spa on 19 September 1888. Spa hosted the finish of Stage 2 of the 2010 Tour de France on July 5. As the famed site of healing cold springs, Spa has been frequented as a watering-place since as early as the 14th century. Though other sources of healing mineral springs have become famous throughout the world, it is the town of Spa which has become eponymous with any place having a natural water source that is believed to possess special health-giving properties, as a spa. 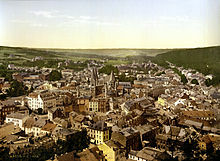 The Spa town grew at that time, in the oldest iron and steel centre of the province of Liege. The "ban Spa", was created around 1335 and included two urban concentrations, "vilhe of Creppe" and "vilhe" Spas, 2 kilometres (1.2 miles) away. The steel industry prior to the exploitation of mineral water developed communication lines, which made it possible to develop the spa town. Pliny the Elder noted "In Tongrie, country of Gaul, there is a famous source, whose water, while sparkling bubbles, a ferruginous taste that is, however, feel that when we finished drinking. This water purges the body, cures fevers and dispels calculous affections. "(C lib.XXXI VIII). In 1559 there appeared in the famous work of Gilbert Lymborh "Acid fountains of the Ardennes forest and primarily those located in Spa." It was translated into Latin, Italian and Spanish. As early as 1547, Agustino, physician to the King of England, Henry VIII, was staying at Spa and helped give knowledge to the world of the value of the Spa water. In July 1565 the gentry of the provinces met in Spa under the pretext of taking the waters. At the hotel "Aux Armes of England", those present agreed to oppose the edicts of Philip II which were austere and intolerant; this is the history "Compromise of Nobles." In 1654, Charles II of England stayed at Spa, which made the place even more famous. A postal system between Spa and the outside world was established in 1699. Since the 18th century casinos have also been located in the town. In 1918, the German Army established its principal headquarters in Spa, and it was from here that the delegates set out for the French lines to meet Marshal Foch and sue for peace in the consultations leading up to the Armistice which ended the First World War. During the Great War of 1914-1918, Spa was an important German convalescent hospital town between 1914 and 1917. The general headquarters of Kaiser Wilhelm II was, in 1918, the last place where he resided before his removal due to the German surrender. In July 1920 it hosted the Spa Conference, a meeting of the Supreme Council. German delegates were invited to this to discuss war reparations. World War II saw Spa reoccupied by the Germans but the town escaped the Battle of the Bulge in 1945 that stopped, luckily for Spa, just at its gates. The Marshall Plan helped Belgium to recover quickly. 1950 and 1960, gradually led to the development of mass tourism replacing the Spa elite as customers. These were decades of social tourism as well, with an attendance of more and more numerous Flemish and Dutch customers, while the Walloons went en masse to the Belgian coast in Flanders. Tourism relaxation replaced the thermal aspect of Spa. May 17, 1983 to mark the 400th anniversary of the export of Spa waters, HM King Baudouin visited the new facilities of the Spa Monopole SA, the Henrijean Hydrology Institute and the Thermal Establishment. A special train Brussels-Spa led the morning delegates and foreign and Belgian journalists. On behalf of the European Association and the European Union Sources of natural mineral water which is headquartered in Paris, Paul Bordier, president at the annual conference of the association, gave the train a conference dealing European mineral water market. Then, arriving by helicopter, King Baudouin lands in the park fermière Company and visited the city and its tourist facilities and spa. The years 1980 and 1990, announced the beginning of an infrastructure renewal and Spa radiation. In 1994, a new French song festival is created: the "Francofolies". In 2007, 150,000 spectators attend the festival. In 1997, the area of Spa-Bérinzenne opens the Education Centre on the environment one of whose specialties is water, etc. In 2005, a new center "thermoludism" born on the hill of Annette and Lubin with panoramic views of the city. It is directly linked by funicular to the heart of the city and a new hotel luxe. In 2007, the Spa-Francorchamps circuit completely renew its infrastructure to comply with the best international standards, allowing it to continue to host each year, the Formula One Grand Prix 1 in Belgium, in addition to many other sporting events annual. Spa has two railway stations: Spa and Spa-Géronstère, where local trains of SNCB/NMBS link the city with Theux, Verviers and Aachen. The railway line used to extend further south towards Trois-Ponts, Vielsalm and Luxembourg. Local and regional bus services in Spa are provided by the Walloon transport company TEC. Spa is located on the crosspoint of national roads N62, N629 and N686. The nearest motorway is the A27 (E42), where a junction for Spa is located in the commune of Jalhay. The Coat of Arms for Spa is a stylized pouhon housed in a neoclassical monument to the covering surrounded by a protective wall opened its facade. The monument is topped by a blue banner bearing the "Spa-Pouhon" inscriptions. "Argent masonry money pouhon of sand topped with gold-SPA Pouhon inscriptions on a blue background." The city colours are yellow and blue. The stylized pouhon is inspired by the monument that housed the pouhon Peter the Great until 1820. Under the Old Regime, the shield was commonly used in spa towns. It was customary for the spa guests to leave their arms at the hotel where he had stayed in recognition of the benefits of the waters. At Spa, many hotels have inscriptions like "In the Arms of England", "the Duke of Orleans," "To the King of Poland", etc. Spa has an oceanic climate that is made more continental by its higher elevation and inland position compared to other Belgian climates at lower level or closer to the sea. Spa has a relatively high precipitation year round, with tricky weather something that the Spa-Francorchamps race track is known for. The elevation also results in cooler summers and frequent winter frost along with snowfall. Spa is quite gloomy year round although averaging both a drier and sunnier climate than nearby locations Stavelot and Malmedy that are also surrounding the race track. Georges Krins, a violinist on the RMS Titanic. Giacomo Meyerbeer, composer, completed his opera here Robert le diable in 1830. The 1975 film Barry Lyndon is partly set in Spa during the eighteenth century. The 1975 film Belle is wholly set in contemporary Spa and its environs. Agatha Christie's fictional detective Hercule Poirot was born in Spa. ^ Extrait de l'article du journal La Vie spadoise. Wikimedia Commons has media related to Spa, Belgium.